Ford Taurus is an Affordable Sedan With Impressive Interior Features. This year's Ford Taurus provides interior style along with some great comfort and convenience features. Consumers love the high-quality materials that are used throughout the interior. Each vehicle comes standard with a heated steering wheel, heated and cooling front seats, heated outboard rear seats and an upgradeable Sony Audio Sound System with HD Radio technology. 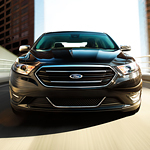 With the sedan market picking back up thanks to great fuel efficiency and convenience, the Ford Taurus is a vehicle to consider this model year. You can choose the standard versions of the trim levels available, or you can choose to upgrade your interior to make for a much sportier option. Leather seating is available in charcoal gray or black. Soy seat cushions are even an option if you want to choose an eco-friendly and natural option for your Taurus vehicle of choice.